The head of the Lebanese Forces Party, Samir Geagea, denied all rumors and interpretations concerning his visit to Saudi Arabia and affirmed that the key purpose was to meet with the custodian of the two holy mosques, King Salman bin Abdul-Aziz [Al Saud], and get to know the new Saudi leadership. He added, “There are rumors to the effect that my visit to Saudi Arabia was motivated by the latter’s commitment to the rapprochement underway between [Free Patriotic Movement leader] Michel Aoun and myself. This is incorrect, for it was an introductory meeting also aimed at discussing the pertinent dossiers of the Arab world as well as the latest developments in the region.” He also stressed the fact that Saudi Arabia did not interfere in Lebanese affairs. 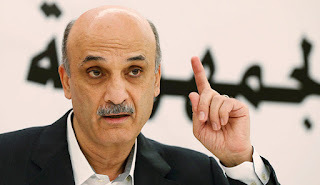 In an interview with Al-Hayat after his meeting with the Saudi monarch in Jeddah, Samir Geagea indicated that Iran, through its proxies in Lebanon, was responsible for the country’s inability to elect a president. He said the emergence of a state in Lebanon was not at the top of Iran’s list of priorities, dominated by the need for Hezbollah to remain the key player therein — for the election of a president would contribute to the emergence of a true state and weaken Hezbollah’s role in Lebanon. Samir Geagea also touched on the subject of the Iranian nuclear deal and the role played by Tehran in the region, affirming that Lebanon was safe from the threat of the Islamic State, which all Lebanese stood against. Geagea further talked about efforts underway to reach an agreement with the Free Patriotic Movement. Al-Hayat: What was the purpose of your visit to Saudi Arabia? Samir Geagea: It was my honor to visit Saudi Arabia on multiple occasions during the past five years, at a rate of once every five to six months, depending on the political developments taking place in the Arab world. During my previous visit, which served to offer condolences for the passing of the custodian of the two holy mosques, King Abdullah bin Abdulaziz, I discussed with my Saudi brothers the need to meet with the kingdom’s new leadership, and a date was set for an official visit to also meet with King Salman. Al-Hayat: What are the issues that were discussed during your talks in Jeddah? Samir Geagea: We discussed all Arab issues and developments, starting with Iraq, Syria and the events in Sinai, all the way to Yemen and Libya. I can affirm that the meeting was an occasion to meet the new Saudi leadership. And I hereby deny all rumors and interpretations that circulate every time I visit the kingdom. My previous visit last fall, when I met with the late Prince Saud al-Faisal, was incorrectly interpreted, particularly from the context of it coinciding with the then-proposal to extend the term of the Lebanese parliament. Rumors spread that it was Saudi Arabia that convinced me to accept the extension, which is incorrect. Truth be told, we in Beirut, through the current Cabinet, did not prepare for parliamentary elections. As a result, extending parliament’s term became unavoidable, because failure to do so would have created a complete power vacuum. At that time, we began discussions led by parliament Speaker Nabih Berri, and we agreed that a new electoral law be drafted during said extension period, whereby passing the law would enable us to make ready for new elections. In fact, the extension of parliament’s term was adopted based on that logic, and the relevant committee did meet; yet, alas, the agreement with Speaker Berri was never fully implemented. I therefore ask myself: Why did the other factions start rumors claiming that Saudi Arabia convinced me to accept the extension? Rumormongering never ceased and continued with claims that Saudi Arabia was keen on achieving a rapprochement between Samir Geagea and Gen. Aoun, with that being the main purpose for my visit to the kingdom — all of which is incorrect, for Saudi Arabia does not meddle in internal affairs and plays no role on the domestic Lebanese political scene. Al-Hayat: Why has Lebanon been without a president for all this time? Samir Geagea: The problem of Lebanon’s presidential elections lies in Iran’s current opposition to such elections, as evidenced by the fact that its allies are responsible for sabotaging those elections, for two reasons. First, because the emergence of a Lebanese state is not atop Iran’s list of priorities, which are dominated by the need for Hezbollah to remain the key player in the country — for the election of a president would contribute to the emergence of a true state and weaken Hezbollah’s role in Lebanon. The second reason is that, if Iran were to agree to presidential elections, it wants the new president to serve Hezbollah’s interests and not the interests of the Lebanese state. Consequently, it is disrupting the elections as a means to exercise pressure for the choosing of a president amenable to its needs. Al-Hayat: Is there no chance for national agreement in that regard? Samir Geagea: Truthfully, I see nothing new on the horizon, and the Lebanese presidency will remain vacant as long as Iran’s allies sabotage efforts to conclude the electoral process and the choosing of a new president of the Lebanese Republic, whom we want to safeguard state interests above anything or anyone else. Al-Hayat: Based on the statements and political stances of Gen. Aoun, we surmise that Lebanon’s Christians are fragmented and in disagreement. What efforts are there to overcome those difficulties? Samir Geagea: Yes, efforts have been underway for the past six months with the Free Patriotic Movement — efforts that have succeeded to a large extent to relieve old tensions and allay the disputes and animosity of the previous 30 years. In fact, they managed to transform enmity into competition between two parties, particularly with regard to the draft dual nationality law and the new draft electoral law, which is the first item for discussion in parliament. But much still needs to be done in this regard, for as is widely known, we come from a long history of disparate political stances; yet, we will expend every effort to make this experiment a success. We continue to rely on the national dialogue sessions, in light of the differing points of view regarding a number of issues such as our disagreements with Hezbollah, the events in Syria, the participation of some Lebanese factions in the Syrian war, and the direction to be taken by Lebanese diplomacy. We continue to discuss these issues in the hope of reaching common ground in their regard. Al-Hayat: Some Lebanese factions repeatedly ask that the Taif Agreement be amended. What is your position in that regard? What options are there to satisfy those demands? Samir Geagea: Despite all the talk about amending the Taif Agreement, no one has yet submitted an alternative. Talk about amending its provisions is not enough, when no alternatives are available. The Taif Agreement is the closest basis for a Lebanese state, and all calls and opinions to the contrary must be rejected, for they will lead to a power vacuum until an alternative is found. Al-Hayat: Do you think that the nuclear deal between Iran and world powers will afford Tehran greater capacity to manipulate the region? Samir Geagea: I am not against the nuclear agreement per se, particularly considering that it serves to put aside the nuclear issue for the next 10 to 15 years, which is a good time period. But, Iran’s problem right now revolves around its unnatural expansion into the Arab world. As a result of the nuclear deal, Iran’s economic revenues will increase, allowing it to play a bigger role in the region and the countries in which it has a presence such as Iraq, Syria, Lebanon and Yemen. In all honesty, I am wary of the repercussions of the deal on events in the Arab world. There are also those who wager on the nuclear deal engendering a new era of Iranian intervention that will serve to bolster Tehran’s rapprochement with the West. As a result thereof, internal reforms will be undertaken and changes will be made to its regional foreign policy as well. But personally, I am not a supporter of this view. Al-Hayat: Did Iran’s meddling in Yemen leave Saudi Arabia any other choice than to intervene to protect the legitimate government there through Operation Decisive Storm? Samir Geagea: We have seen Iran’s direct as well as indirect presence expand in various countries of the region. A reaction was necessary to counter this Iranian expansion into the Arab world. Operation Decisive Storm came as a natural response to the events that transpired, particularly in light of the fact that Iranian expansion was at the doorstep of Saudi Arabia’s southern border. The formation of an Arab coalition in Operation Decisive Storm is also a normal occurrence, albeit tardy in countering Iran’s constant actions inside the Arab world. Al-Hayat: Is Lebanon in danger of IS? What are the preventive measures capable of thwarting its spread to Lebanon from Syria and Iraq? Samir Geagea: IS is a threat to humanity as a whole. All the Lebanese stand against this organization, rendering impossible its advent to Lebanese territories, and negating the danger it poses on the country. The only avenue for IS gaining a foothold in Lebanon is through Lebanon’s Sunni population; other sectarian factions, such as Christians, Shiites and Druze, cannot gain entry into the organization. But this avenue is tightly shut, because Lebanon’s Sunnis are moderates, as reflected by the Future Movement, which represents Sunnis and is characterized by its moderate and centrist stance. From this standpoint, we are confident that IS shall not pose a threat to Lebanon. Al-Hayat: To what extent is there coordination between your party and the government of Tammam Salam? Samir Geagea: We have an extremely cordial and friendly relationship with Prime Minister Salam, despite us not being directly represented in his Cabinet, because from the onset we believed that such a government would be unable to effectively function, as is currently the case. Lebanon’s government is the country’s executive branch, and it cannot be effective if haphazardly formed as was Salam’s Cabinet, nor will it be able to properly serve citizens, as evidenced by the current garbage collection crisis.